“Emoji and Smiley”is Great Japanese Emoticons and smiley!! 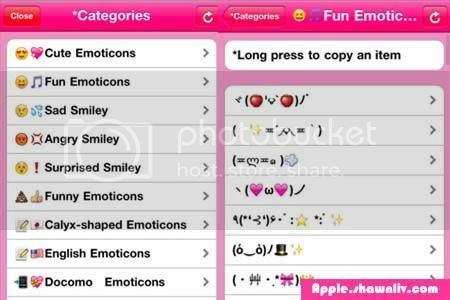 This is the first application adding Emoji to emoticons in the world.!! Let’s make mail and twitter lovely and cuty!!!! “What’s the emoticons!? “everyone may say to you! Let’s attract to the friend by using a cute emoticons!! Let’s try to brag to friends by using a funny emoticons!! You can easily copy by tapping! you can use emoticons quickly without exiting the application!